The traditional division of historic and prehistoric periods into “ages” is a device of convenience rather than something which reflects real chronological time. If one takes literally the transition from the Neolithic (“New Stone Age”) to the Bronze Age, it is easy to imagine the people of the time throwing away their stone tools one day and embracing the new metal technology the next. Of course, things did not happen that way in reality, and the transition from Neolithic to Bronze Age (as indeed from any age to another) was gradual. The process should rather be seen as changes in emphasis regarding trade, technology, social interactions, and food production. There had, for example, been a change of emphasis at the start of the Neolithic (around 5000 BC) when the old hunter/gatherer lifestyle was gradually replaced by more static farming as a way of life. This change would have led to a redefinition of the relationships which communities held with the land. The more settled existence would have probably led to an increased importance in land ownership, and lines of ancestry associated with particular areas. The importance of ancestry in the Neolithic is perhaps best seen in the long barrows (or man-made burial mounds) built by the people of the time to inter the dead of their communities. These in all likelihood had a large significance as symbolising the veneration of ancestors, and also stood out as prominent territorial markers. Excavations have revealed that long barrows may have fulfilled a range of other ceremonial activities. Neolithic barrows, although containing the remains of the dead, seem to have been monuments of ancestors en masse, rather than of individual people. Neolithic barrows often had the bones of individuals intermixed. The bones may have been left to decompose in the open, or possibly in mortuary enclosures prior to being placed in the barrows. Sites interpreted as elongated mortuary enclosures are often similar in shape and size to the long barrows, but are thought not to have had a covering mound. The best known barrows from this period include the spectacular West Kennet long barrow in Wiltshire. In Norfolk, however, there is only rare evidence of their remains. 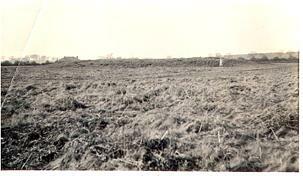 This is in the main part due to intense later cultivation, most of the remains having been ploughed flat over the years. One of the few (relatively) undisturbed barrows is at Broome Heath, Ditchingham (NHER 10597). This barrow is 35m long and 2m high. There has been no recent excavation of it. It may contain structures found in long barrows elsewhere, such as burial chambers, cremation pyres and dumps of household rubbish (broken pots, flint tools and animal bone). It is possible that a rather informal dig in 1858 unearthed a skeleton here, but no definite record exists today. Three other long barrows survive at Harpley (NHER 3637), West Rudham (NHER 3611) and Felthorpe (NHER 7763). 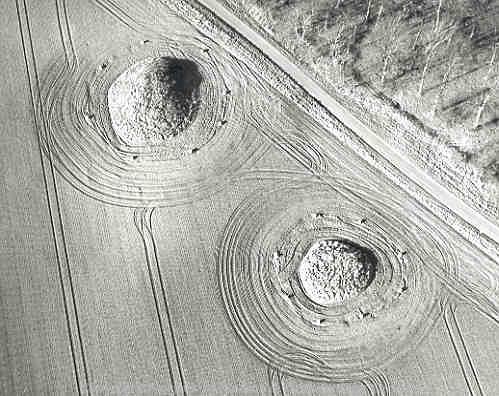 Aerial photography has led to the discovery of further possible long barrows or elongated mortuary enclosures that exist only as cropmarks and buried features, the mounds or structures having been destroyed by later ploughing. The ditch that once surrounded the barrow often shows on aerial photographs as a darker pattern in crop growth, especially in drought conditions. Often nothing remains on the ground, and only from the air do these sites become apparent as cropmarks. Examples of these types of sites have been identified at Roughton (NHER 38485), Marlingford (NHER 13357) and Tuttington (NHER 31740). This last site was completely unknown until 1996, and has its outline interrupted in at least six places at the eastern end. These may have been causeways across the perimeter ditch, or post pits, a possible timber version of the stone façades of the great long barrows of Wiltshire and the Severn Valley. The transition between the Later Neolithic and the Early Bronze Age was, as discussed above, a gradual one. People are likely to have adopted some elements of the new material culture and associated social statement, but rejected others. The two ways of living would have mixed together, rather than running parallel. The transition would have been slow with lots of overlap. A good example of this is the Grimes Graves flint mining site in Weeting parish (NHER 5640). This flint mining industry does not seem to have started until the Late Neolithic, but continued well into the Bronze Age. Thus flint is usually associated with the Neolithic, yet its use continues and develops through the Bronze Age, a period not usually characterised by stoneworking. The latter part of the Neolithic in Norfolk (and elsewhere) seems to have been characterised by complex changes in both economy and society. Pottery, which had appeared for the first time earlier in this period, began to become more distinctive, including beakers, the design of which originated in Germany and the Low Countries, pointing to Continental influences. Metal knives, of copper, and later bronze, appeared as imports. Flint daggers seem to have become fashionable, and copies of these metal types were skilfully made during the transitional period. The complex changes in society, lifestyle and landscape that fed the advance of metal technology also led to changes in burial practice. Round barrows are the characteristic burial monuments for this period. Large round barrows appear in the late Neolithic from around 3,000 BC, but then continue, to become characteristic of the Bronze Age as the more dominant burial rite. 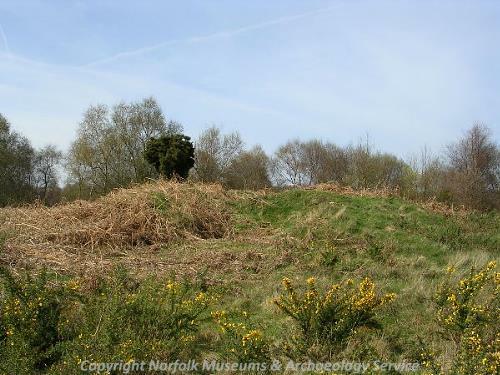 The most numerous of Norfolk’s probable prehistoric sites, they usually consist of a circular earthwork surrounded by one or more ditches, the fill of which was thrown up onto a central mound. Round barrows are also important as the earliest known monuments which preserve the remains of individuals, or groups of individuals. Variations in the shape and size of Bronze Age barrows has led them to be classified as distinct groups e.g. bowl, bell, saucer and disc. However, it is often impossible to differentiate the types from what remains. The majority of round barrows in Norfolk have been flattened by later ploughing, and nothing can be seen from the ground. As before, though, cropmark remains do show up as “ring ditches” from the air, and more are discovered every year. Another factor hindering one’s ability to classify these barrows is the fact that out of over 1000 possible sites, relatively few have been excavated. There are, however, some barrow sites in Norfolk that have escaped the plough. The reasons for this are mainly to do with their location away from agriculture, for instance on heathland, as at the large barrow cemetery at Salthouse (NHER 6212). This has a large central “bowl” barrow, surrounded by a number of smaller barrows. 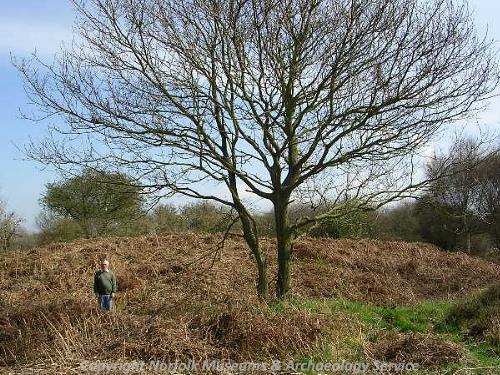 The central barrow is about 15m in diameter and 0.8m high today, though it would have stood taller originally. This central mound is surrounded by seven other smaller barrows that form part of an extended Bronze Age cemetery. Some of these barrows have been excavated, and in each case cremated human remains were discovered in urns dating from the Middle Bronze Age (1200-1000 BC). Another group of barrows to survive is to be found in a plantation at Weasenham All Saints (including NHER 25446, 3654 and 3660). As stated, Norfolk being an intensively cultivated area, most round barrows have been ploughed flat, leaving only marks of the surrounding ditches visible from the air. Sometimes, usually in the face of development, these have been excavated as at Caistor St Edmund. A series of ring ditches had been known here from aerial photographs, but they were in the way of the future Norwich Southern Bypass. The site (NHER 9794) was excavated prior to the bypass’ construction, revealing several flattened barrows, including one with a burial that had been laid on a bier resembling a shallow draughted boat. A Bronze Age round barrow that was also used as the meeting place for Greenhoe Hundred until the 17th century. Not all barrows located within arable cultivation have been ploughed. Two round barrows at Harpley (NHER 3528 and 3903) survive near the edge of a regularly ploughed field. For many years the barrows were ploughed around, rather than through. They eventually became Scheduled Ancient Monuments, and are now sectioned off from the main arable cultivation area. It seems that the practice of building round barrows lasted until the Late Bronze Age, when it became more the practice for the dead to be cremated and buried in flat cemeteries, their remains placed in bucket-like urns. At that time there was also widespread re-use of barrows, with cremations in urns being added to earlier sites. There is also a Late Bronze Age cemetery at Salthouse (NHER 6212) which has “mini barrows” placed over the remains. Barrows from this time are important, as in most cases they represent the only remaining landscape evidence of human activities during the period. We don't know what kind of houses people lived in. 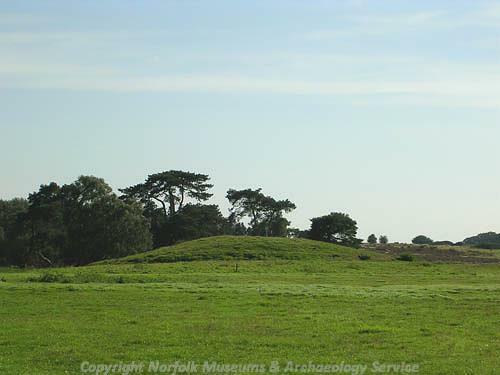 We have some knowledge of the culture from metal tools, weapons and jewellery finds (Norfolk is rich in these), but the barrows remain of vital importance in helping us to try and understand the society of the time. Piet Aldridge, (NLA), July 2005. Ashwin, T., 1996. ‘Neolithic and Bronze Age Norfolk’, Proceedings of the Prehistoric Society 62. Lawson, Martin and Priddy, 1981. ‘The Barrows of East Anglia’, East Anglian Archaeology 12. Margeson, S., Ayers, B. and Heywood, S. (eds. ), 1996. A Festival of Norfolk Archaeology (Norfolk, Norfolk and Norwich Archaeology Society). Parker Pearson, M., 1993. Bronze Age Britain (London, English Heritage). Wade-Martins, P. (ed. ), 1987. Norfolk from the Air: Volume One (Gressenhall, Norfolk Museums Service). Wade-Martins, P. (ed. ), 1989. Norfolk from the Air: Volume Two (Gressenhall, Norfolk Museums Service). Wade-Martins, P., (ed. ), 1993. An Historical Atlas of Norfolk (Gressenhall, Norfolk Museums Service). Woodward, A., 2000. British Barrows – A matter of life and death (Stroud, Tempus Publishing).